A dense sheet of electrons accelerated to close to the speed of light can act as a tuneable mirror that can generate bursts of laser-like radiation in the short wavelength range via reflection. A team of physicists from the Max-Planck-Institute of Quantum Optics (MPQ) in Garching, the Ludwig-Maximilians-Universität (LMU) München, the Queens University Belfast (QUB) and the Rutherford Appleton Laboratory (RAL) near Oxford created such a mirror in a recent experiment. 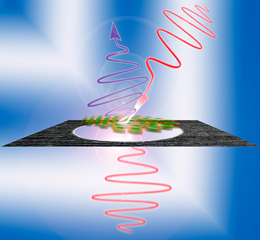 The scientists used an intense laser pulse to accelerate a dense sheet of electrons from a nanometre-thin foil to close to the speed of light and reflected a counter-propagating laser pulse from this relativistic mirror. With this experiment, the physicistsmanaged to carry out a Gedankenexperiment (thought experiment) formulated in 1905 by Albert Einstein stating that the reflection from a mirror moving close to the speed of light could in principle result in bright light pulses in the short wavelength range. The researchers report on their results in Nature Communications, 23. April, 2013. In everyday life, reflections of light are usually observed from surfaces that are at rest such as thereflection from a piece of glass or a smooth surface of water. But, what happens if one creates a mirror moving incredibly fast, close to the speed of light? This question was answered more than a century ago by Albert Einsteins in 1905 in his theory of special relativity. Now, an international team of researchers investigated that question in an experiment. In the experiment conducted at the Rutherford Appleton Laboratory near Oxford the physicists irradiated a nanometre-thin, freestanding foil with a 50 femtosecond short, ultra-intense laser pulse (one femtosecond is a millionth of a billionth of a second).The impinging laser pulse liberated electrons from the carbon atoms of the foil and rapidly accelerated to close to the speed of light in less than a micrometer forming a dense sheet of electrons capable of acting as a mirror. “This mirror structure is stable for only a few femtoseconds“, explains Daniel Kiefer, who wrote his Dissertation on this topic. Within this extremely short life time the scientists shot a secondary laser pulse with a wavelength in the near infrared (800 nm) and a pulse duration of several femtoseconds from the opposite direction on the generated relativistic mirror structure. In stark contrast to a mirror at rest, light reflected from a mirror that is moving is changed in its colour (that is in its wavelength) as the reflected photons gain momentum from the mirror. This process is very similar to a ball that bounces off a racket and thereby accelerates to higher speed. However, instead of moving faster (photons already travel at the speed of light), the reflected light is shifted in its frequency. This phenomenon is very similar to the Dopplereffect observed from an ambulance siren, which sounds higher (louder) or deeper (quieter) depending on whether the ambulance is moving towards or away from the observer. In the experiment, the incredibly high velocity of the electron mirror gave rise to a change in frequency upon reflection from the near infrared to the extreme ultraviolet up to a wavelength of 60 to 80 nanometre. Moreoever, the time duration of the reflected pulses was on the order of a few hundred attoseconds only (one attosecond is a billionth of a billionth of a second). This experiment not only supports Albert Einstein’s theory of special relativity, but in fact paves the way for a new method to generate intense, attosecond short flashes of light. Those pulses would allow the electron motion in atoms to be resolved thus giving deep insight into elementary processes in nature, which are so far largely unexplored.